This is not any sort of pleasure. Losing keys causes nothing but angst, inconvenience and a questioning of mental competence. But it happens and I usually do not have a clue how. Last week I took some stuff out of my car, opened up the garage, put the stuff away. Because I had my hands full I put the keys down – somewhere – whilst I crammed things into a disgracefully disorganised cupboard and vowed, once more, to have a good tidy up. When the job was done I looked round for my keys but could not find them. Damn – they had vanished. I looked in all the right places, several times, but they were not there. Gone, it was almost as if they had dematerialised. they must be somewhere but if they have slipped behind something or into a box of bits and pieces they will take some finding (did I mention the garage is a mess?). 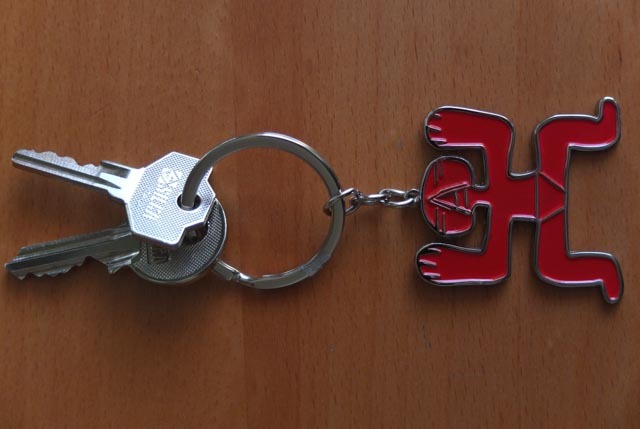 It is not worth worrying to much about as I have spares, but I have a slight regret about the key ring. It came from Grizedale and although I mostly paid it no attention, sometimes, not very frequently but sometimes, I remembered where it came from. A thought of fresh air, scenery and the Lake District to leaven the day is always good. The photo shows the replacement. It comes from visiting the exhibition at the British Museum - ‘Beyond El Dorado: the power of gold in ancient Columbia’. These little figures just amused me – for no good reason – and that is all that is needed for a memory trigger.